Paddy offer the most complete betting app for horse racing punters. 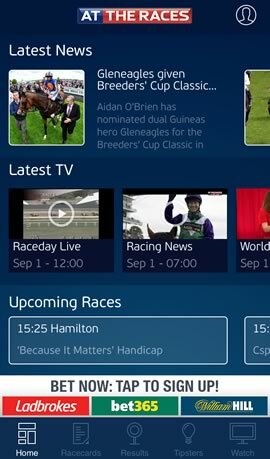 In addition to live streams of horse racing on mobile, you can also watch an entire archive of horse racing from the UK and Ireland for free. Watch instant race replays & their entire archive of 13,000 races on your phone. View a detailed career race history for every runner from your iPhone or Android. Excellent horse race tipping section by their team of expert racing tipsters. Watch At The Races TV programs like Sunday Forum and Irish Angle on mobile. At The Races is a British TV channel and website which provides live coverage of horse racing all over the world, especially in the UK. The service was launched in 2002 and is owned in partnership between Sky plc and several UK racecourse owners. This includes the Arena Racing Company, which operates 15 tracks, including the all weather circuits at Lingfield Park, Wolverhampton and Southall. The channel also covers many of the top Irish meetings, such as Leopardstown and Punchestown. Here you can watch Willie Mullins and Noel Meade trained horse, like of Annie Power and Road to Riches being rode to victory at home, under the expertise of Ruby Walsh and Bryan Cooper. 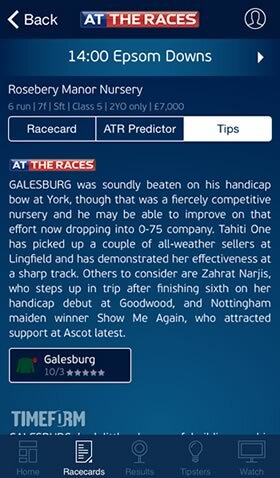 This review explains all about the At The Races mobile app. First up you can find out how to install it and what benefits you gain from creating an account. Then the homepage is looked at followed by the race-cards, results and videos, before finishing off with the tipping area. 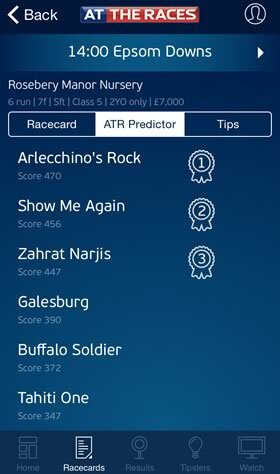 The ATR app can be installed directly from the At The Races website, or iOS users can find it in the Apple Store. Once downloaded the app takes you through a brief tutorial and then you are straight onto the homepage. The homepage contains the top racing news stories, written over the last two or three days, along a selection of videos, including ATR's racing previews, reviews and features from the previous 24 hours. Below these are scrolling links to the next racecards, and at the bottom of the screen you can see the tabs taking you to the other content on the app. There is an option to log in on the top right. While you don't need to do this in order to use the majority of functions, an ATR account allows you to add horses to a tracker, which can be done either from the results section of the app, or via the website. Then you will receive a notification when the horse is due to run again, along with quick access to its form and any notes you wish to add. Under here you also have the ability to log into your Ladbrokes, William Hill account. 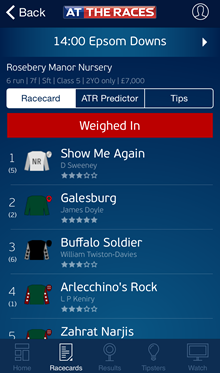 The At The Races app for iPhone, Android and iPad then allows you to place bets, using your online betting accounts. This allows you to get bets on quicker, and avoid the hassle of switching from one app to the other. The tabs at the bottom of the homepage cover the race cards, results, tipsters and more video streams. The race cards section covers all the UK & Ireland meetings taking place over the next four days, which can be scrolled through. By clicking on the meeting you can see all the races scheduled and horses entered. Then by selection a horse, shown with their jockey, you can find out details, such as the trainer, age, weight carried and official rating. There is also a quick form guide, with an option to view the full form page. Under the results, you can find out how the races ended up. This goes back for a week, and is filtered in a similar way to the race cards. First off you go into the meeting, then the top three finishers for each race is listed, along with their SP and an option to view the full result. Here you can see how every horse finished up, along with notes, access to their form and the option to add them to your tracker. With each form card and race result is the option to watch races that were shown on ATR. These are streamed in HD quality and can either be watched in full, or you can skip to the finish. These are great tools to help you review races and see how a horse performed, along with its strengths and weaknesses. The video tab also contains all the races from the previous 24hrs, along with the latest Racing News program, the days Racing Review and segments shown over the last few days. 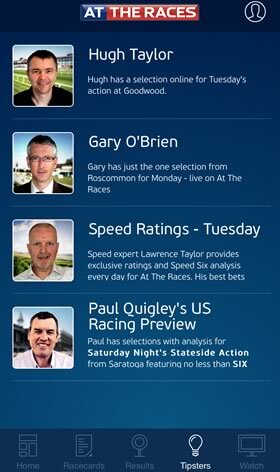 The Tipster section on the At The Races app, gives you access to their team of experts. Every day you can find detailed explanations of their best bets of the day, along with how many points they recommend and at what price. As well as having an all round love for racing, many of these are experts in specific areas, such as Gary O'Brien, who specialises in Irish racing or Paul Quigley who shares insights on US action. You can also find tipsters using Speed Ratings too. These break down the timings of horses previous races and use this information as a primary indicator to make the selections. In addition to the raw speed data, in these write ups you can expect to find other factors considered, such as the breeding of the horse and the going for the day's race. To help you judge the race for yourself, under each race you can find the ATR Predictor and Tips pages. The predictor combines all the raw data on the horses, such as course wins, weight, trainer form and Official Ratings, and selects the top three finishers. The tips page meanwhile gives the official selection from At The Races and Timeform, along with a brief write up. Whether you are a serious punter, or just enjoy racing, the At The Races App has a lot to offer. Not only can you get detailed information on the days racing and results, there is plenty of advice and tips. The combination of the horse tracker and ability to log into your online bookmaker accounts, means you never have to miss a bet again. Plus you can review the videos of many races, to help you with your future picks or just relive past victories!